OS/2 2.0 PM chess game (executables). Version 1.01 of OS/2 PM port of GNUCHESS 3.1. Modified by Kent Cedola for use under the OS/2 PM environment. Copyright (C) 1986, 1987, 1988, 1989, 1990 Free Software Foundation, Inc. This file is part of CHESS. General Public License for full details. only under the conditions described in the CHESS General Public License. notice must be preserved on all copies. games with lots of hexes. should be moved to it's own window for example. place. Without his effort I would of never attempted the PM port. 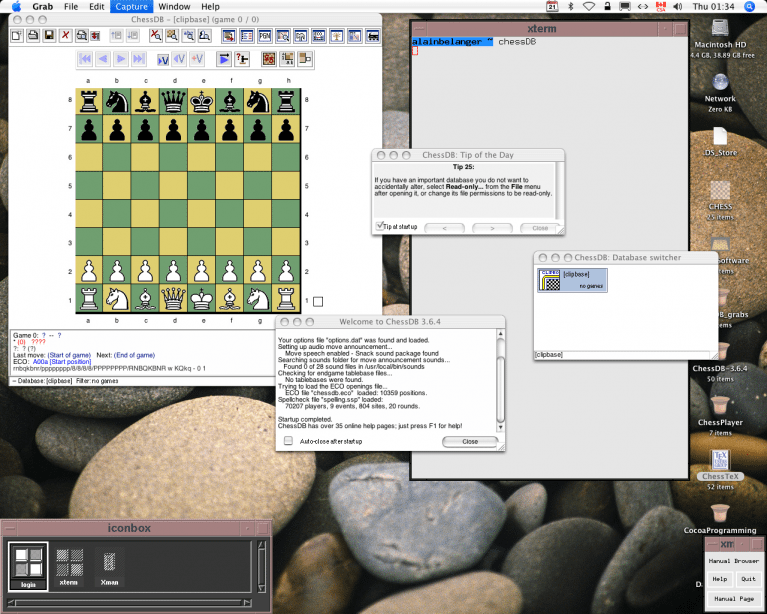 Version 1.01 of MicroSoft Windows port of GNUCHESS 3.1. 2) Fixed problem with promoting pawn. 5) Properly frees memory when program ends. 7) Added GNU copyleft to source files. orignal source except to "windowize" it. 1) I have only tested this under windows 3.0 386 enhanced mode. Seems to work ok in real mode though slower. 2) It requires at least 282k of memory. 3) Fits on a EGA screen, no scrolling implemented. 4) Most of the GNUCHESS commands are implemented. 5) When computer is playing itself abort by clicking on any square. this message. You may have to remove the last move. 6) To have the computer think while it is your turn, select "easy"
7) There is no help file. store various settings. Currently only the screen colors.